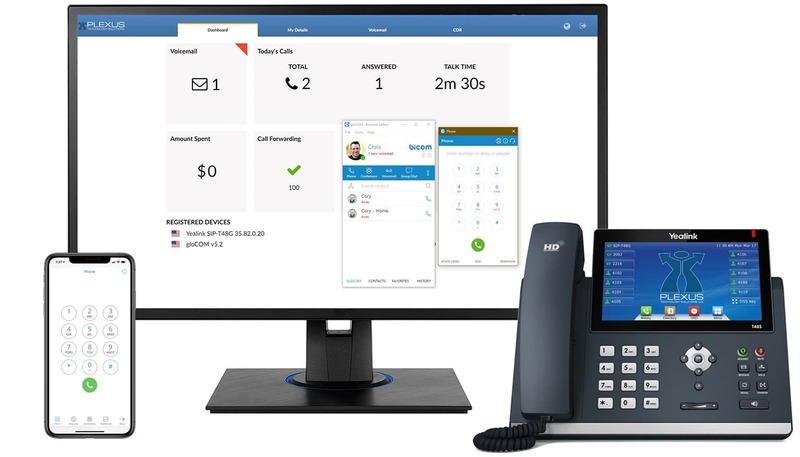 Exchange your outdated phone company and their expensive bill when you switch to a phone system built precisely for your business communication: Voice over Internet Protocol or VoIP. Not only is a VoIP call’s quality superior to traditional phone services, VoIP is far more cost-effective and offers a wide array of business-minded features to increase your company’s productivity. Therefore, it’s a necessary essential for any company in the 21st century. VoIP delivers a plethora of features that will make you and your staff happy. Some of the most dynamic features are crisp call quality, web portal access, unified messaging and communication desktop application. Our unified communication desktop application provides the ability for click-to-call, call monitoring and user presence. As a business owner, having the capability of call following is a wonderful way to keep yourself accessible to your clients and employees. It also has the capacity to to allow for do not disturb to forward the call directly to voicemail or another extension for immediate pickup. Our auto-attendant feature creates a digital receptionist that allow callers to direct themselves to the correct extension or department. Business leaders worry about the security of VoIP for the same reason they worry about online data security in lots of different use cases. Security risks can always be mitigated, and professionally installed VoIP networks are highly secure. We at Plexus Technology Solutions provide end-to-end encryption on your VoIP system to avoid any possible data breach or risk. Data will be encrypted on every possible layer. User security is also an important factor to protecting your company’s VoIP network and service. Enforcing strong password rules and restricting the use of insecure Wi-Fi networks while making VoIP calls are proactive ways your business and staff can keep your network free from breaches. We will help you to put in place the right security measures to make sure your VoIP infrastructure meets the necessary security requirements. You can rest assure that your VoIP solution, when acquired from Plexus Technology Solutions, will meet all the important regulatory obligations, including HIPAA compliance. Small businesses that convert to VoIP reduce the cost of their local call costs by up to 40%, and save up to 90% on international calls. To break it down, a business with 30 users could see a savings of up to $1200 per month with a new VoIP system. Of course, cost savings isn’t the only appeal of VoIP and unified communications, UC. VoIP and UC allows your staff to do their jobs from virtually anywhere in the world. This type of flexibility can lead to a rise in productivity of nearly 20%. In 2017, companies saw a rise in mobile working, with 37% of employees saying they telecommute at least part time. These mobile employees have ended up saving 40 minutes per day and gained 3 ½ days of working time every year. Productivity doesn’t end with mobile workers, UC and VoIP can help save all employees an average of 32 minutes per day, because it becomes so much easier to reach people on the first try rather than playing phone tag. So what do these statistics mean for your organization? Making the switch to VoIP today is easier and more cost effective than ever.